The 13th century saw considerable intellectual development in Europe and a number of new weapons appeared as well. 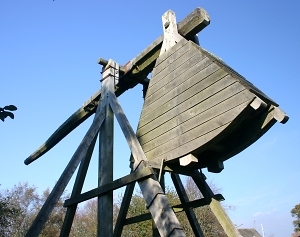 At the start of the century the trebuchet was developed and this was followed later by the longbow. The trebuchet was developed from the perriere (or petraria) which was basically a stone thrower. Oddly the trebuchet arrived just as the curtain walls of castles were becoming much higher. Was there a link between the two? Probably not and the main defensive development remained the use of enfilade from projecting towers. The siege of Castelnaudry in 1211 AD was the first time that a trebuchet is mentioned. Photo shows a wooden replica of a trebuchet currently on display at Caerlaverock Castle in Scotland which King Edward I of England lay siege to in 1300 AD. The longbow was developed for use against body armour. Technique and continuous practice meant that a hand drawn bow could cope as well a mechanically drawn cross bow, and it was a lot quicker as well. Whilst the longbow was principally a battlefield weapon, the crossbow remained dominant in sieges. The only feature of fortification which was amended for the longbow was the appearance of long arrowslits. In reality, what you would need to protect yourself against these deadly weapons would be durable and long lasting protective clothing.